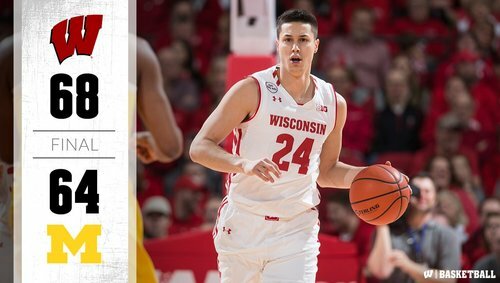 H2: Wagner's two free throws ends Wisconsin's 15-0 run. UW leads 58-51 with 2:17 left. H2: Walton hits a big 3 and Michigan calls time. It's 60-54 Wisconsin with 1:55 left. #Badgers hot stretch brings them up to 56.5% shooting this half. #Badgers likely gonna have to make FTs to salt this one away. 66.9% on the season, 6 of 12 tonight. MOE WAGNER FOULS OUT! JOHN MCCLANE WINS AGAIN! Hayes to the line for 2 FTs. H2: Another 3 from Walton and the lead is cut to 5. H2: Walton hits a 3 and the lead is cut to 4. Badgers going to the line. D.J. Wilson fouls out. Wilson with zero points on four shots in 30 minutes. Maybe everyone will foul out for Michigan and the the Badgers will go on the power play? He splits the pair, but Nigel Hayes is there for the rebound! He's fouled. H2: Irvin with a 3 and it's a 2-point game!!
. @zirvin with a game-high 20 points on the night!! 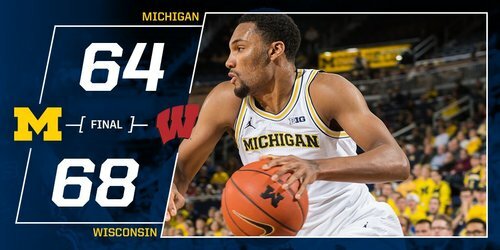 FINAL: No.17 Wisconsin 68, Michigan 64. Badgers make 12 of their final 16 shots in the second half to erase an 8-point deficit. At some point Wisconsin will lose a game because of this free throw shooting. Not tonight, though. #Badgers win 68-64. Final: #Badgers 68, Michigan 64. Koenig scores 13 of his 16 points in the second half, including 10 during a 15-0 run. FINAL SCORING: Koenig 16, Brown 13, Hayes 13, Happ 11, Showalter 6, Hill 5, Trice 4. UW shot 54.2 percent in the second half. Alright folks, @drewhamm5 logging off here! Thanks for following along! We only lost 5 followers during the game! @zirvin21 led four Wolverines in double-figures with a game-high 20 points. 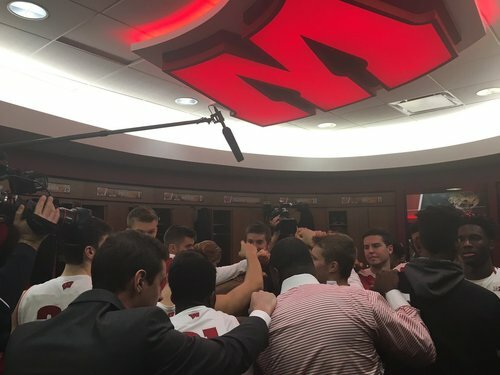 #Badgers story filed but not posted yet. Give a game ball to Koenig (16 pts) in a 68-64 victory. John Beilein: The competition level has to grow in all phases of our game. We really competed right to the last seconds. "That was a gut check fellas. Way to be the last man standing. Great job."